This year many celebrities is holidaying aboard super-yachts (anything over 150 ft) and even mega-yachts (300 ft and over). Onboard, the A-list holiday in the lap of luxury: swimming pools and spas, helipads and butlers, satellite communication and medical centres. Everyone from Brad and Angelina to the Beckhams are living it up on the high seas, though some stars are actually paying their way. Some yachts are rented and some of them borrowed from an even richer mate. Take a look at the full rundown on the famous folk’s nautical hijinks after the break! 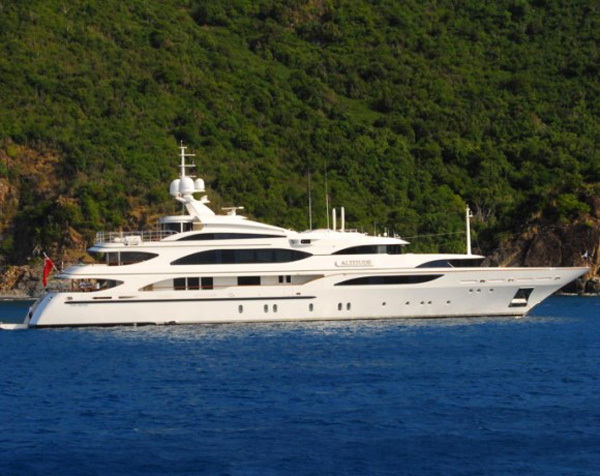 Madonna has borrowed Russian oligarch Roman Abramovich’s brand new, the 377 ft Luna yacht, while filming the new Duke of Windsor movie she’s directing in the South of France. The yacht is fitted out with two helicopter pads, a covered pool, spa, medical center, hot tub and 40 staff, including butlers and a macrobiotic chef. R&B’s royal couple have been cruising on the French Riviera on a $40 million superyach. The pair, who earned an estimated $150 million between them last year, are chartering the 180 ft Altitude, built by Italy’s Benetti yachts in 2003, for $370,000 a week.The vast split-level owner’s apartment has his and hers white marble bathrooms, a separate study and a private 180º raised observation lounge with spectacular views forward. A sun deck features a huge spa pool complete with wetbar and a well equipped gymnasium. The yacht can accommodate 14 guests in 6 cabins. The Sherlock Holmes director has been showing off his new girlfriend, the model Jackie Ainsley, as he holidays off Spain on board the $46 million super-yacht, which costs $470,000 a week to rent. The Utopia yacht is thought to be owned by Roger Jenkins, the Barclays executive who earns $60 million a year. The floors are marble, the walls are lined with silk and the leather handrails are by the people who make the steering wheels on Bentleys. There is a whirlpool pool and the main suite has a hot tub. The TV star is one of the few celebs footing the bill for his fun, having shelled out a whopping $975,000 per week to charter the 196 ft Slipstream. The 12-berth yacht boasts sumptuous leather sofas, mirrors above a giant waterbed, a Jacuzzi, an observation lounge with panoramic views, gym, a sky lounge with a retractable roof and a crew of 14 including a private chef. Top Shop boss Sir Philip Green, worth $6.16 billion, has offered his wayward protegee Kate Moss and her boyfriend Jamie Hince the use of his 206 ft, $50 million, the Lionheart yacht. The crew of 30 will need to ensure there is plenty of champagne on board. According to sources, Kate likes to spend most of her time on board drinking Dom Perignon. The boat, whose former guests have included Sylvester Stallone and Jennifer Lopez, has ten bedrooms, a swimming pool, hot tub and cinema. Posh and Becks have borrowed their pal designer Roberto Cavalli’s iridescent 133 ft, the RC yacht, which features a leopardskin interior, 15 bedrooms, a gym, whirlpool spa and locker full of fur coats for when the weather turns cool. Supposedly Cavalli only allows clothes he designed to be worn onboard. Even this millionairess has been left awestruck by the 300 ft Tatoosh yacht (which as we recently reported has been put up for sale). Paris and her sister Nicky are on a month-long holiday on the boat owned by Microsoft co-founder Paul Allen. It’s thought he’s loaned it for free, but it normally costs $616,000 a week to hire. The best summer of my life, Paris has written online. Our yacht is incredible! I’m in heaven on the water. Definitely the biggest and best yacht everywhere we go. Love it! Huge! The Tatoosh has a pool, hot tub, cinema, basketball court, recording studio, spa, massage room, gym, games room and helicopter pad. The Desperate Housewife and her basketball star husband Tony Parker hired a relatively cheap yacht at a mere $110,000 per week to sail around Italy and Croatia. The $15 million, 135 ft Ladyship yacht has six guest bedrooms, a crew of eight, diving equipment, jet skis, kayaks and plasma TVs, but apparently not a basketball court. The model and her British musician husband are forking out £400,000 a week to take family and friends around the South of France on the Indian Empress yacht. The 311 ft boat is owned by Indian billionaire Vijay Mallya and is a palace on water, with Renoirs and Chagalls on the walls and Elton John’s baby grand piano in the stateroom. The boat sleeps 32 guests and 42 crew and has a gym, beauty salon, sauna, steam room, whirlpool spa and swimming pool. 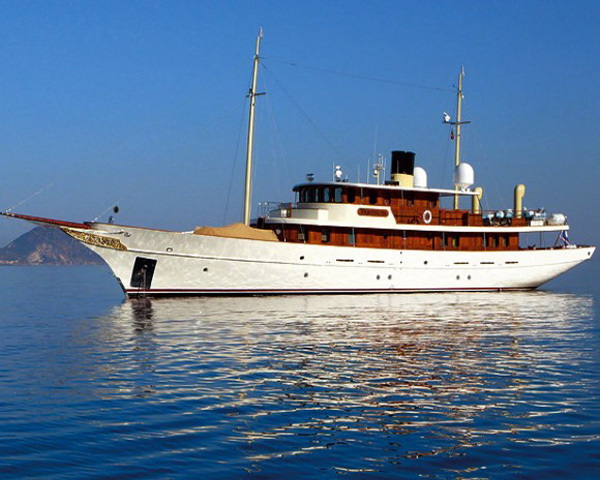 The world’s most famous movie star couple have borrowed Johnny Depp’s classic, the 156 ft Vajoliroja yacht, which as we noted, is available for charter at $130,000 per week. The mahogany paneled craft features accommodations for 10 guests and a crew of 8, a formal dining room, library, plush salon and outdoor seating and eating areas, all decorated in Depp’s signature version of Art Deco Paris meets the Orient Express.